If you rent your property, you may be reluctant to spend your time maintaining the garden. It’s a place to hang out your washing, let the kids run off a little bit of steam perhaps, and somewhere to put your outside bin. And while this is fine, and a functional way of looking at your rented property’s garden, remember that while you live there, it’s also an outdoor space that you can enjoy! A rented property’s garden can be so much more than a practical space: it can be somewhere to entertain friends, a relaxing sun trap, or a kitchen garden. And what’s more, it’s easy to spruce up a rented garden with minimum outlay on your part. Pots and containers are a great way to brighten up any garden, rented or otherwise. And the great thing about plant pots is that you can take them with you if you move! Mix and match your containers, both in the sense of using a diverse collection of pots and planters, and also by planting colourful plants and flowers in some of them, and reserving others to create a small herb garden. Group the pots together to create a focal point which will instantly brighten up your rented garden space. Using lighting and bright colours is an easy way to add a dash of vibrancy to your rented garden. Festoon lights are very popular at the moment, and if you have a patio area, they can be strung either overhead or along fencing to shed light on the area. Just as with the containers, you can pack them up and take them with you, should you move house. Similarly, if you don’t want to, or don’t have the right to paint fencing or sheds in bright colours, consider using plastic garden bunting to add a splash of colour, instead. Vegetables are great for reluctant gardeners, simply because it’s very rewarding to grow something edible. Just like herbs, many fruits and vegetables can be grown in containers, making them portable if you move. For example, strawberries look great in terracotta strawberry pots, cherry tomatoes can flourish tumbling out of hanging baskets, and the likes of pumpkins can even be grown in old crates. Vegetables can often add colour to small spaces too, so are both practical and pretty. Again, furniture is something which will move with you, so choose pieces which you know you’ll like and will enjoy in future properties, too. You may wish to choose lightweight pieces if possible, simply so that you’re not lugging heavy and clunky furniture from home to home. Remember bright cushions quickly spruce up plain furniture and are easily transported when you move! Although you may not wish to do so, mowing the lawn and pruning overhanging branches and bushes will really open up the space to you and make it much more enjoyable to spend time in your little patch of the outdoors. Similarly, if you have any broken fence panels or patios, for example, ask your landlord to instruct a professional garden landscape company to fix any hard landscaping as soon as possible. Although you may not wish to put down roots in a rented property, a little bit of garden know how and maintenance can go a long way. If you or your landlord needs a little bit of extra help, contact D&G Garden World. 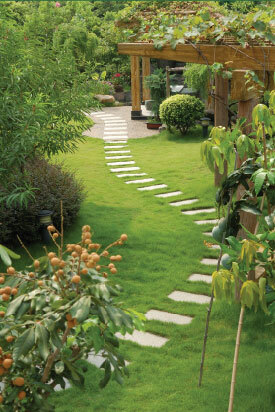 As professional garden landscapers, we can help to spruce up any garden.